I made may way south to Christchurch to rejoin NCR2, following the coast for several miles. Unfortunately there was a reasonable headwind, so I wasn’t able the cycle that fast despite it being flat. I then picked up NCR25 and followed this pretty much to Blandford Forum, then followed some main roads to Shillingstone to find another segment of NCR25 on a portion of a former railway trackbed. The route takes you onto the platform of the station at the village where some rails begin and there is what appears to be a formative preserved railway group. Recently Sustrans sent out a message to their volunteer rangers (of which I’m one) requesting that every milepost on the network receives a safety check. 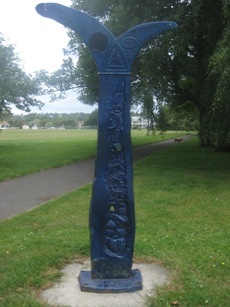 This is because somebody recently leant against a milepost and it fell over. So, since I’m passing lots of mileposts during my trip anyway I’ve been checking each one as I pass it. I’ve also been logging them to ensure that they’re all on OpenCycleMap. Unfortunately the Internet access is down at the B&B that I’m staying at tonight. So I’ll upload this blog entry at the next opportunity. Today’s ride took me through Portsmouth and Southampton before heading through the New Forest to the village of Bransgore, which is relatively near to Christchurch. I lost a bit of time in Portsmouth and Southampton because of the usual delay when navigating through urban areas. I made up some of the time by resorting to a slightly more major road in Portsmouth instead of a route through a housing estate that I’d originally planned. I also cut out a detour into Hythe near Southampton, saving me probably a couple of miles. Shortly after I reached the New Forest National Park it started to spit with rain, but then that eased off again. I took lots of photos of the scenery there; it’s a lovely place. A fair amount of my journey through the New Forest was on the various cycling tracks available. However I don’t think I actually covered any new ground on top of the fantastic New Forest coverage that OpenStreetMap already has. Having the OSM data on my GPS certainly made it easier to stick to my planned route. During my urban travels today I briefly met a gentlemen who quipped that I should use a car instead. When I explained that that wouldn’t work for a charity ride he very generously offered £20 of sponsorship. Gary and Suzy, the friendly couple who own the B&B I’m staying at tonight, suggested that they’ll forego the remaining half beyond the deposit of my overnight stay, donating it as sponsorship for the ride instead. Today’s cycling was mainly on the flat and following the coast. At the end of the day however I headed inland and through Chichester to the nearby village of East Ashling. 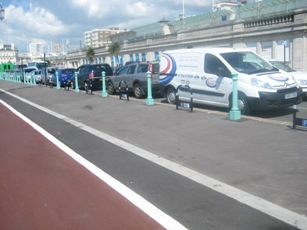 Whilst passing through Brighton I noticed that there has been an additional cycle lane marked along Madeira Drive, together with the addition some new cycle parking. I particularly liked the cycle parking (pictured), spaced at one car intervals. Cycling levels were pretty high in Brighton, so it looks like the injection of funding that the city received recently is having an impact. I’ve also mapped several advanced stop lines, something which I’ve been planning to document on OpenStreetMap, but haven’t yet got round to. I’m using relations of type=advanced_stop_line, with one node for the junction at which the ASL occurs and a way for each of the approaching roads that has an ASL. I think it’d be great to see these rendered on the cycle map. I’ll start to upload my GPS traces soon, such that those of you in OpenStreetMap can see exactly where I’ve been so far. Unfortunately the Internet access here is a little unreliable though, otherwise they’d be uploaded tonight. My mileage for the next couple of days is a bit higher – around the 70 mile mark – so I should be getting lots of data, but may not have quite so much time to deal with the backlog of entering it all immediately. Most of today’s cycling was on routes that I’ve already covered in the past, but a few bits were brand new to me. Almost all of the route from now on will be brand new to me. So I’ll need to pay more attention to the navigating in order to keep to my planned route. Last night I did a quick Internet search for bike shops in Hastings and found that there’s one located pretty close to where I’m staying. So I paid them a visit this morning with the intention of getting my broken spoke replaced. Unfortunately, like everything in Hastings, I had to climb a hill to get there, but then to replace the spoke (and map the shop!) it would be worth it. It wasn’t quite that easy though. It turns out that the shop is closed on both Sundays and Mondays, so I couldn’t have even gone yesterday had I known about the shop in time. I made a call to my dad, who first found a BMX shop, unfortunately not suitable for my bike, and then a shop in the next town I was due to visit, Bexhill. 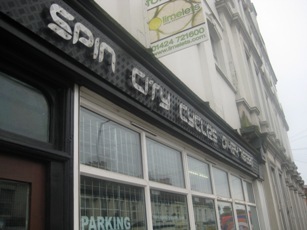 Luckily finding them was also easy, and it means yet another bike shop’s been mapped. My replacement spoke is now in place and I was back on the road (and cycle path) again. 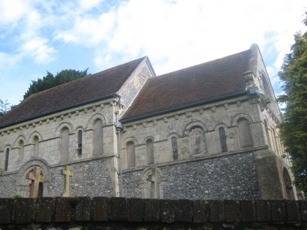 Today’s journey took me along a short section of National Cycle Route 1 in Canterbury to reach Regional Cycle Route 16 to Dover, passing the historic St. Nicholas’s church in Barfrestone (pictured left). 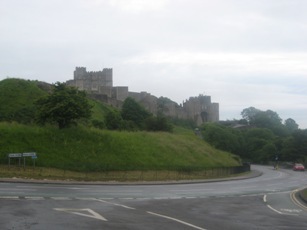 I then followed NCR1 again in Dover past the castle (pictured right) for a short while to reach National Cycle Route 2, which I followed all of the way to Hastings, passing through Folkestone, Hythe, across the Romney Marsh, crossing into East Sussex and then through the historic town of Rye, and after a few small places and a climb over Fairlight hill I reached Hastings. Todays only mishaps were forgetting to zero my odometer before I left from the station (I remembered approximately a mile into the journey), not noticing that the battery had exhausted on my GPS for a few minutes (so there’s a small gap in the trace, but that’s already mapped anyway), and having a spoke break on my bike’s rear wheel as I entered Rye. I couldn’t find a bike shop in Rye, and by the time I reached Hastings they’d all have closed. I’ve now located on online in Hastings so shall pay them a visit tomorrow morning to get a replacement spoke, plus a few spare ones just in case it should happen again. That said, it’s the very first spoke that I’ve had break, so another breaking seems unlikely. It’s taken a few hours to enter the additional mapping that I gathered today. It’s mainly minor details though, so you probably wouldn’t spot any changes on the map unless I directed you towards them. 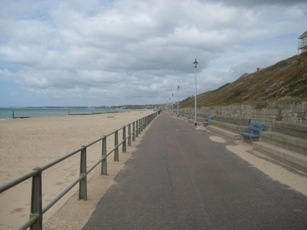 Tomorrow’s journey should be a bit more relaxed, continuing to follow NCR2 and finishing at Seaford. Elevations aren’t shown on the large scale 1:1,000,000 map, which would have been useful for planning the general route I should be taking to avoid excessive climbing. So, instead I’ve been using the excellent OpenCycleMap which clearly shows elevations at almost all scales. It also has the distinct advantage of showing cycle routes where they’ve already been surveyed for the OpenStreetMap project. There doesn’t appear to be a built-in function to be able to split a route at a waypoint, or to merge two routes together. This would have been very useful to have when I was working out exactly where my overnight stops should be. Instead I resorted to exporting the relevant routes to GPX files and splitting joining them using a text editor before reimporting them. If I accidentally left the properties window open in the middle of this then I’d suffer the same performance issue mentioned above as it updated to my change. I’m a large contributor of data to the aforementioned OpenStreetMap project and I’ll be surveying the entire route with the intention of adding all of the data to OSM. Many portions of my planned route have been specifically chosen because to enhance OSM’s already excellent coverage of the National Cycle Network. The return journey uses large portions of NCR1 from John O’Groats back to Canterbury and I hope that we may have complete coverage of the route in OSM by the end of my travels. I printed all of my maps and planning documents today. The maps amount to exactly 250 pages. My planning documents show that I’ll have a cumulative ascent (and descent naturally since it’s a full-circle trip) of approximately 50KM. Not bad going. You are currently browsing the Three Corners Cycle Ride blog archives for June, 2009.